Ticket Free Day in Oslo! As a part of Free Public Transport Day, we, in Planka Oslo, have decided to name our campaign day Ticket Free Day. We’re celebrating the occation with a concert on the subway! This upcoming saturday we will meet at the suburban station of Vestli on the eastern outskirts of Oslo. Ida Isax will play for us and the concert will take us into the city, celebrating the “T-bane” as a truly public space, open and available to all. Our choice of departure is not coincidental. The consequences of environmental impacts are most often felt in low income areas with high rates of poor or/and immigrant dwellers. As far as Oslo goes, the worst of these consequences present themselves in the eastern suburbs of Oslo. It’s worth mentioning that Oslo has the highest rates of air-pollution cities in Europe in the winter time. But this saturday we will celebrate. 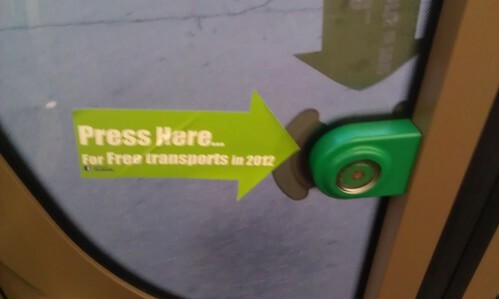 Free the public transports! Free Public Transports in Brussels have started their actions by putting stickers on the vast majority of outdoor ticket machines. The stickers points at the confirmation button. During the peak hour, the group placed the same stickers on the doors of the tramways, on all trams of the main lines of Brussels. The sticker points at the button to open the doors. The goal of the campaign is to associate the usage that the people are doing of the infrastructure with the concept of free transports. In other words, the first goal is to sensibilize the population to this problematic, in a more funny way! Stay tuned on the Facebook page! The annual free public transport day occurs on the first Saturday of March and was first celebrated by the swedish commuter network Planka.nu with a large subway demonstration in the subway in Stockholm on the first of March 2008. This year the free public transport day will be celebrated on March 3 and we hope that everyone of you will join us in the celebration! In Stockholm there will, among other things, be political rallies and opening of barriers in the public transport system. Our friends in Berlin are organizing a cosy event in the metro on the international free public transport day tomorrow/today 5th of March. Have a look at their video below and join in! join us for freepublictransportday! from seemiramis on Vimeo. Take a ride on the free public transport day! Re-make the S-bahn – refurnish a wagon to a living room – a friendly action supporting ideas of free public transport. Bring what you think belongs in your living room. A few suggestions: carpets, plants, pictures, curtains, cushions, knitting equipment, musical intsruments… and ducktape and strings to attach items. Invite friends, spread the word and do not be afraid to show up to support the action, also if you did not have the time to bring anything else than yourself! FPT-day is coming up this saturday. Things are happening all around, so don’t hesitate to contact us if you are planning something where you live! In Sweden, different initiatives are gathered on www.nolltaxa.nu (in Swedish only as of yet). The program includes actions in Stockholm, seminars and leafleting in Malmö and free buses in Mora – where the annual ski race Vasaloppet takes place the same weekend. In Germany Berlin fährt frei (Berlin rides for free) calls out for the participation in the rally: “Stand up for a different railway politics!” that is happening on the International Day of Action for Free Public Transport—Saturday March 5, 2011—from 15:00 at Potsdamer Platz. Berlin fährt frei will be speaking at the event. Berlin rides for free—Bus and train without the need for tickets! For the right to mobility and against social exclusion. For real environmental and climate politics and fewer cars. Because so, everyone’s quality of life improves and because common goods must be organized democratically. Berlin rides for free—The city belongs to us! In Florianopolis, Brazil, a Carnival parade is being planned for Free Public Transport day. “Bloco” is when someone, usually a band, goes on top of a truck parading on the streets and the crowd follows dancing samba or funk. In this case the band or the “bloco” is called “BONDE DOS CATRAQUEIRAS” and the carnival event will be used to promote free transportation.People are asked to bring pots and pans to make noise and to bring a white t-shirt that will be painted with the “bloco” graphics. Sounds an amazing party! We wish you a happy Free Public Transport Day! The first public demonstration against the price increase was performed on January the 6th, gathering around 170 people in Bandeira Square. After the assembly and after “Carlito” danced the called “Funk against the rase” it was held a rally. Streets and cross roads were closed, thereby giving the voices in the demonstration a bigger importance and attention. The city hall tried, along with the bus companies, to demobilize the population of Joinville, planing the increase of the bus fares for a holiday season (Christmas and New Year). Hoping thereby to pass this increase without any further explanations, an extremely undemocratic attitude . But the population answerd with noise on the streets, making sure they were heard on the city hall as the polititions didn’t open the issue to debate with the popular sector, debating it only with the bus companies. Thus it was launched the campaign “$ 2.30 IS THEFT, ” which demands the withdrawal of the fare on public transport and the end of the comercialization of the public transportation on the city. Transportation has to be public, it’s not an object of profitable business for some. The protesters have declared a new manifestation date: Tuesday, 11/01 at 18h in Bandeira Square.